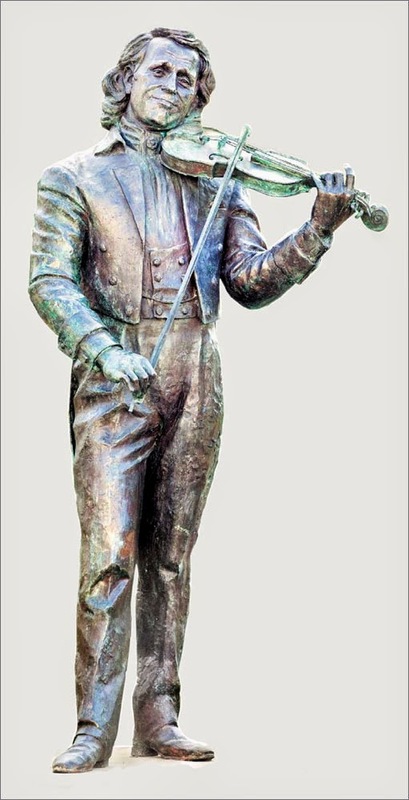 The Limburger by Stefan Gybels/John Hoofs: In 2009 the Russian artist Alexander Taratynov on his own initiative created a life size bronze statue of André Rieu that is now collecting dust in Nazareth. Between the tails of his coat and the upper leg of the bronze poured statue of violinist and orchestra leader André Rieu (that is located in the studio hallway of the Russian artist Alexander Taratynov) cobwebs are visible. Which is logical in a dusty environment. The nameplate of the artist and the year of creation (2009) can be found inside. Taratynov has been trying ever since, without results, to find a place for it in Maastricht, but now it seems he may have found a buyer. He does not want to reveal who the interested party for the bronze Rieu is, which he fashioned by hand from concert recordings and photographs. There is no doubt about the likeness. Whoever views the statue knows exactly who it portrays. According to Taratynov, Rieu said the same when he saw a picture of the statue. It was once displayed in a public area, but has never had a permanent place. And all the while, the city of Maastricht is very thankful to the orchestra leader since his Vrijthof concerts bring an enormous economic to the city. In July Rieu for the tenth year in a row will again perform on the Vrijthof. His fiftieth performance with his orchestra on the Maastricht square will be held there. He expects to welcome the 500,000th visitor since his concert series started on 9 July 2005. I can understand Andre, as a modest man, not wanting this bronze to be on public display, but perhaps in one of the Maastricht museums ........unless of course Andre is persuaded to change his mind!! André est un immense artiste et mérite bien tous les hommages que l'on puisse lui rendre mais je ne pense pas qu'il apprécie d'avoir sa statue sur la place du Vrijthof, il est bien trop modeste pour cela. J4espère qu'il continuera le plus longtemps possible à charmer son public qui l'adore et le lui fait savoir en assistant toujours plus nombreux à ses concerts et je duis sûre que c'est ce qu'il aime le mieux! Francine.